Safe, stable and nurturing relationships and environments are essential to preventing child maltreatment and to assuring that all children can reach their full potential. The Nurturing Programme is based on the idea that we can enhance parents' skills to improve family relationships and parents' emotional health, as well as the emotional health and development of their children. 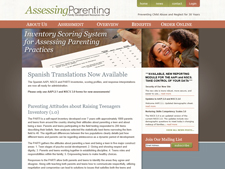 The Spanish AAPI, NSCS and PARTI inventories, scoring profiles, and response interpretations are now all ready for administration. The functional purpose of assessment is to gather information for decision makers. Families, professionals in the helping fields, agency administrators and funding sources are typical decision makers that rely on information to assist them in their decision making. 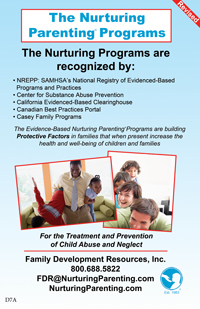 The Nurturing Programs are Evidence-Based, Trauma-Informed programs that involve the entire family. 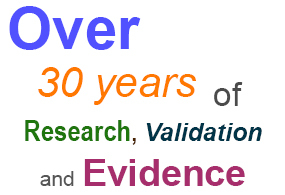 The Nurturing Program Research web site has been created to support your interest in knowing and understanding the decades of research that support the effectiveness of the Nurturing Programs. What Are Nurturing Parenting Programs? The long term goals are to prevent recidivism in families receiving social services, lower the rate of multi-parent teenage pregnancies, reduce the rate of juvenile delinquency and alcohol abuse, and stop the intergenerational cycle of child abuse by teaching positive parenting behaviors. Looking for a Facilitator Training Workshop? Facilitator Training and Seminar Workshops are a generic three-day workshop that teaches the philosophy of Nurturing Parenting and how to implement and facilitate the Nurturing Parenting Programs. Trainings fill quickly so register early! 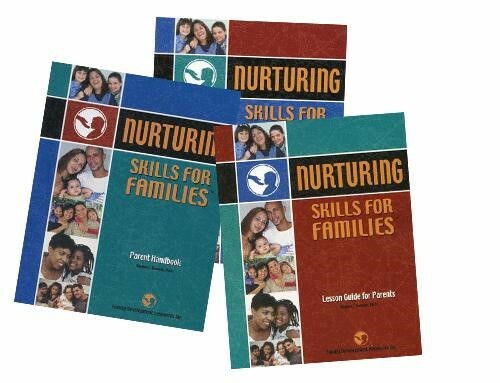 To attend or if you need assistance regarding a Nurturing Parenting Programs Facilitator Training and Seminar Workshop or Training with Dr. Stephen J. Bavolek contact the Family Nurturing Center: FNC@NurturingParenting.com or Phone: 262.652.6501. Six Sessions that Empower Parents and Professionals. IB3 is now in year 3 of the demonstration. We appreciate another opportunity to review growth and progress and to enumerate ongoing challenges with the waiver implementation. Family Links delivers innovative, high quality training in the Nurturing Programme to health and social care services, third sector organisations, schools and universities. 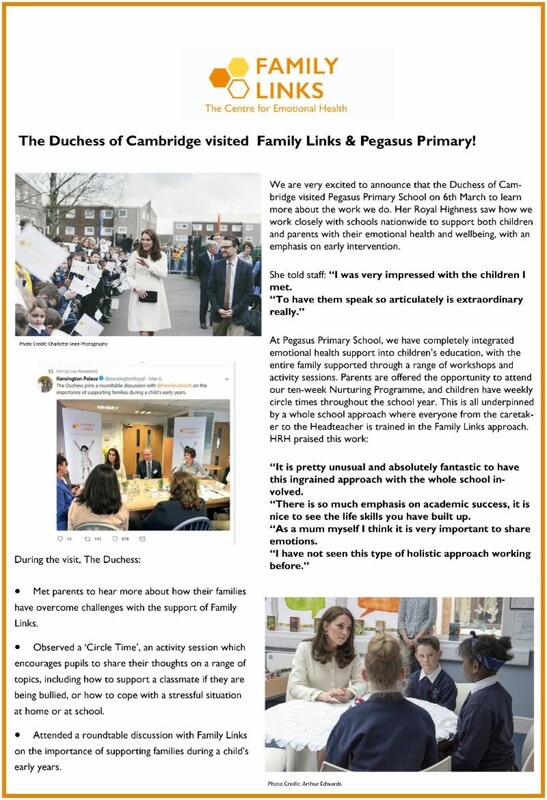 Family Links partners with Canterbury Christ Church University to pioneer an innovative Postgraduate Certificate in Social and Emotional Learning for teachers. The UK’s leading emotional health charity, Family Links, has announced a new partnership with Canterbury Christ Church University to offer the UK’s first Postgraduate Certificate in Social and Emotional Learning. Research & Validation Studies Just Released! 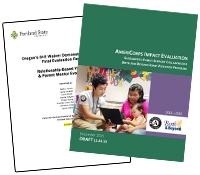 Birth and Beyond AmeriCorps study from 2013 to 2015 utilizes quasi-experimental research design to measure pre-post impact of the Nurturing Parenting Program with longitudinal follow-up data. 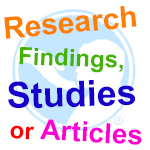 Do you have Research Findings, Studies or Articles pertaining to the Nurturing Parenting Programs? 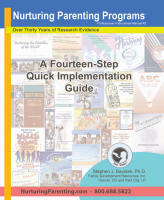 Nurturing Parenting Programs have over 35 years of effectiveness. Numerous Research Findings, Studies and Articles are available here. Family Development Resources has been providing cost-effective, validated approaches to help treat and prevent child abuse and neglect for over 35 years. Our vision is to cultivate a culture of nurturing through the implementation of community-based, family focused education in the philosophy and practices of nurturing. 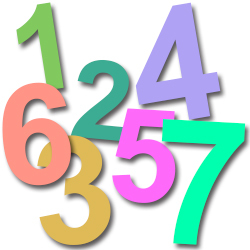 7 Facts You Should Know and Share on the Nurturing Programs! Family Development is committed to meeting the unique needs of families. To this end, approximately 30 programs or program models are available that are designed to meet the family’s educational learning styles and abilities; the family’s culture and language; the ages of the children as well as the ages of the parents. The first step in implementing the Nurturing Parenting Programs is to select the right program(s) for the families you are serving. What Makes Nurturing Parenting Programs Unique? Inappropriate Expectations, Parental lack of Empathy, Strong Belief in the use of Corporal Punishment, Reversing Parent-Child Roles; and Oppressing Children's Power and Independence. The Nurturing Parenting Programs are designed for the prevention and treatment of child abuse and neglect. To meet the specific needs of families, programs have been identified according to the standard levels of prevention: Primary, Secondary (intervention) and Tertiary (treatment). 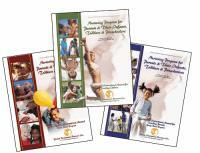 Primary Prevention-Education Programs are designed to empower individuals and families with new knowledge and skills. The Nurturing Parenting Programs are trauma informed, family-based programs designed for the prevention and treatment of child abuse and neglect. 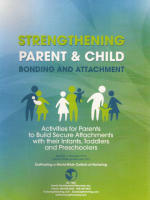 As a family, parents and their children learn positive and caring nurturing skills. The Nurturing Parenting Programs are family-based prevention and intervention programs designed to develop nurturing parenting practices. The program is competency-based. 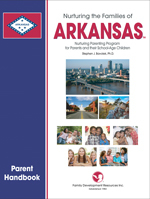 In an effort to prevent more children from coming into the state foster care system, the Arkansas Department of Human Services Division of Children and Family Services (DCFS) is launching a program in March that teaches the fundamentals of becoming a more nurturing parent. The Nurturing Program for Young Parents and Their Families is referred to as a competency-based program. 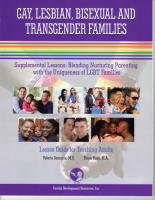 Each lesson has identified competencies the parents need to learn in order for their parenting practices to improve. Family Development Resources has been providing cost-effective, validated approaches to help treat and prevent child abuse and neglect for over 30 years. Please read: "History and Development of the Adult-Adolescent Parenting Inventory and the Nurturing Parenting Programs"
Families learn new skills and attitudes that reduce dysfunction in families, with follow-up studies indicating low rates of recidivism. Since 1983, over 2 million families have participated in the Nurturing Parenting Programs. Family Development is seeking published articles or unpublished research reports regarding the effectiveness of the Nurturing Programs. The articles and reports may be posted on our web site or submitted as additional evidence to national agencies who rate evidence based parenting programs.